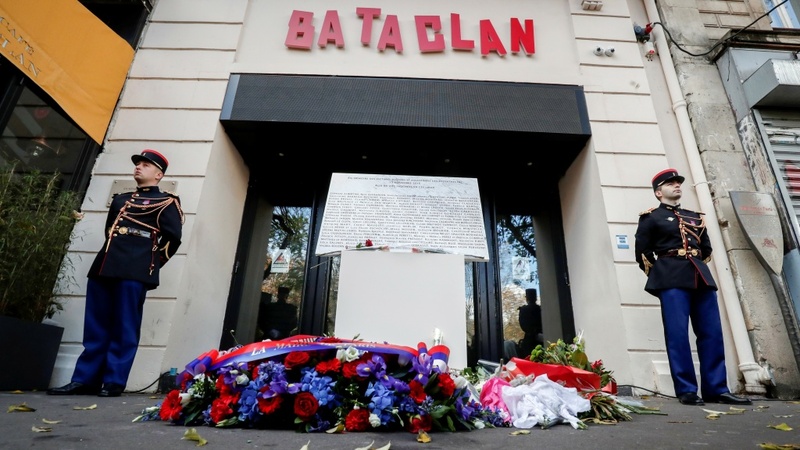 Guards stand in front the Bataclan concert hall in Paris in November 2018, during a ceremony to remember the victims of the attacks in November 2015. On Friday, a man who rented an apartment to two fleeing terrorists received a four-year prison sentence. The onslaught of violence in France's capital killed 130 people and wounded hundreds more. ISIS claimed responsibility for the attacks. Bendaoud, an admitted drug dealer, was nicknamed the "ISIS landlord" but he denied knowing about the men's actions when he agreed to let them rent an apartment in Saint-Denis, a suburb north of Paris. It was "a fetid flat with no water or toilet," the Guardian reported. He helped the fugitives through Abaaoud's cousin, a young French woman named Hasna Aitboulahcen. She had called another drug dealer who connected her with Bendaoud. "Bendaoud described shaking hands with Abaaoud, who arrived at the squat on 17 November wearing a football shirt of the Paris team PSG and asked which direction to pray in. Bendaoud told the owner of a local pizzeria about the 'dodgy Belgians' he had rented a flat to, but he told the court he had not recognised them as the wanted terrorists because he had been high on crack cocaine after a 19-year-old who he was having an affair with told him she was pregnant. He later said the TV in his bedroom had been broken so he had not seen the news." A friend of Aitboulahcen became aware of the jihadists' hideout and contacted authorities. In a dramatic police raid days after the Paris attacks, Abaaoud, a Belgian member of ISIS believed to have orchestrated the attacks, and Akrouh, were killed. Abaaoud's cousin also died in the siege. Around that time, Bendaoud was standing on the street, telling journalists he was unaware of the terrorists' identities, when a police officer arrested him live on camera. A French court acquitted him last year, concluding that prosecutors had not proved that he knew the tenants to be terrorists. The Paris prosecutor's office filed the appeal that ended in a prison sentence. Bendaoud said the ordeal ruined his life, that he wanted compensation and was planning to write a book, according to France 24. The outlet reports that on Friday, he shook his head faintly when the verdict was delivered.